The plaque which was unveiled to commemorate the 35th Anniversary of the Beatles' visit to Bangor.This summer sees fifty years since Sgt Pepper taught the band to play as The Beatles released what is often cited as the first important concept album, Sgt Pepper’s Lonely Hearts Club Band; an album that is generally understood as truly ground-breaking, and as one of those moments which changed (and perhaps even created) an art-form. It’s also fifty years (25-27 August 1967) since the Beatles visited Bangor, a visit which also proved to be a pivotal date in the history of the group. 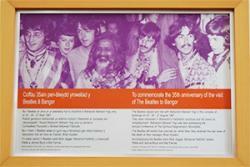 The ‘Fab Four’ had been invited to the Coleg Normal (now part of Bangor University) by Maharishi Mahesh Yogi. Maharishi had repackaged ancient meditation practices and re-presented them to Western audiences as Transcendental Meditation. The Transcendental Meditation Movement, aka the Spiritual Regeneration Movement, had been hosting their UK annual Conference at the Coleg Normal for a number of years. The Beatles were already interested in eastern religions when the Maharishi came to London in August of 1967. George Harrison’s wife Pattie saw flyers for an event in London which the Maharishi Mahesh Yogi himself was to attend, and persuaded George and the other Beatles to go. There, Maharishi invited them to the Conference and course at Bangor (unbeknown to the local organiser) and all four Beatles decided to join the Conference, which was already under way. Here in Bangor, local Daily Post journalist Mr Iorwerth Roberts got wind of the story and informed Coleg Normal Bursar, Mr Gwyn Thomas, that the Beatles were on their way, accompanied by friends Marianne Faithfull and Mick Jagger. Mr Thomas was able to make some arrangements to accommodate the new guests in the Residential warden flats, and to deal with the inevitable journalists and fans, who would come in their wake. It had been a year since the Beatles’ last live concert in San Francisco and public appearances by them were increasingly rare. So, when word broke, Euston station was packed for the departure of what the Daily Mail dubbed the ‘Mystical Special’, but which appeared on the timetable as the more prosaic 3.15 stopping train to Holyhead. Such was the crowd that Cynthia Lennon was mistaken for a fan by a policeman and not allowed to join the train! They had an equally tumultuous reception at Bangor Station on the Friday. On Saturday a public meeting with the Beatles was held in the University’s John Phillips Hall, along with a press conference, where, amid the journalists were two enterprising local school-boys, posing as reporters! Brian Epstein, the Beatles’ manager had been a constant presence in the group’s lives, and had intended to join then on the Monday. The event that could be argued to have turned the Beatles’ fate as a group, was the death of Epstein. Once this news broke, there was obviously increased media interest in the Beatles’ reaction. Described by both Paul McCartney and producer George Martin as ‘the fifth Beatle’, Brian Epstein is credited with much of the group’s success, having changed their image and got them their first major record deal. He was closely involved with the group’s activities, travelling with them on their world tours, and looking after their public image and financial affairs. A post mortem examination later showed that Brian Epstein had died of an overdose of sleeping pills. The death was officially ruled as accidental. Shortly after receiving the news of Epstein’s death, the Beatles cut short their visit to Bangor. Before leaving they gave an interview to Derek Bellis of Harlech Television (now part of ITN), who asked them about their feelings, and of the counselling that they’d received from the Maharishi. That interview went around the world – but it all happened right here in Bangor. At Bangor, students are introduced the Beatles and their music within the context of twentieth-century music, as part of the Year 1 core module The Study of Music module (WXM 1001 and WXM 1002). Prof. Chris Collins and Dr John Cunningham also deliver a year 2 and 3 module on The Beatles (WXM 2160 and WXM 3160), in which they examine the music and recordings of the group though an exploration of the historical and biographical contexts, as well as offering a series of critical and analytical frameworks for a more detailed understanding of the songs.